Mount Sinai Memorial Park Cemetery, Los Angeles, U.S.
Joseph Albert Wapner (November 15, 1919 – February 26, 2017) was an American judge and television personality. He was the first presiding judge of the ongoing reality court show The People's Court. The court show's first run in syndication, with Wapner presiding as judge, lasted from 1981 to 1993, for 12 seasons and 2,484 episodes. 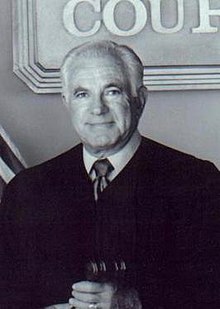 While the show's second run has been presided over by multiple judges, Wapner was the sole judge to preside during the court show's first run. His tenure on the program made him the first jurist of arbitration-based reality court shows, which are now a most popular trend in the judicial genre. Joseph Albert Wapner was born on November 15, 1919, in Los Angeles, California, to Jewish parents who had immigrated there; his father, attorney Joseph Max Wapner (1898-1992), was Romanian, while his mother, Fannie (née Friedman) (1900-1990), was Russian. Wapner had a younger sister named Irene. Wapner attended Hollywood High School and once dated actress Lana Turner while in high school. Wapner was a graduate of the University of Southern California (1941) and the USC Law School (1948), serving in World War II in between. Wapner was awarded the Purple Heart and the Bronze Star while serving in the South Pacific in Cebu. He was honorably discharged from the United States Army as a lieutenant. Wapner was an attorney in private practice for ten years. Appointed by Governor Pat Brown to the Los Angeles Municipal Court in 1959, Wapner served two years before being elevated to the Los Angeles County Superior Court, where he served for 18 years before retiring. While serving on the Superior Court bench, Wapner also served as presiding judge in 1969 and 1970. Wapner was also president of the California Judges Association in 1975 and 1976, and retired from the court on November 16, 1979. Wapner was the first judge to preside over the court show The People's Court. His tenure on the program lasted from 1981 to 1993, making for a grand total of 2,340 half-hour episodes. On the series, he conducted a binding arbitration that was set up to resemble a small claims court by pitting parties, without lawyers, against each other. The legacy of the show's high popularity has led to myriad other similar syndicated courtroom shows, such as Judge Judy and Hot Bench, among others. After 12 seasons on The People's Court, Wapner was not invited back to the series in 1993, when the ratings had dropped to an all-time low. After a four-year hiatus, beginning in 1993, The People's Court returned to the air in 1997, though without Wapner, and still runs today. Wapner has stated that he was told years later that the producers did not want to hurt his feelings; however, he stated that this is exactly what the show did. Wapner also stated that he was not notified when the producers decided to revamp the series. He declined to offer any opinions on the People's Court judges who succeeded him, as he never watched the revamped program. On November 12, 2009, Wapner received a star on the Hollywood Walk of Fame. He and Judith Sheindlin of the television court show Judge Judy were the only two television jurists who have received the honor as of 2009. Wapner was publicly critical of Sheindlin's courtroom approach. On November 13, 2009, in honor of his 90th birthday on November 15, Wapner made a one-time-only return to the court show, acting as a guest judge, presiding over a case in the Marilyn Milian era of The People's Court. Until the summer of 2013, Wapner also held the title of longest-reigning arbiter over The People's Court. However, by completion of the court show's 2012–2013 season, Marilyn Milian captured this title from him and became the longest-reigning judge over the series. Five years after presiding over The People's Court, Wapner returned to television as a judge on the nontraditional courtroom series Judge Wapner's Animal Court, lasting for two seasons (1998–1999 and 1999–2000) on Animal Planet. Wapner authored a book, A View from the Bench (1987, Simon and Schuster, ISBN 9780671638733). He appeared in the second episode of Sliders as himself, in an alternative world where the Soviet Union has conquered the USA. The People's Court is instead a criminal court that hands out long prison sentences, and he is referred as "Commissar Wapner" rather than judge. On August 9, 2008, Wapner appeared as Judge in a Major League Baseball on Fox pregame People's Court parody segment called "The Players Court". On June 27, 1986, Wapner appeared on the Tonight Show to hear a case of David Letterman vs. Johnny Carson over alleged damage to the headlight of Letterman's pickup truck when Carson had the truck towed to the studio. Wapner ruled in favor of Letterman, granting him $24.95. During 1999–2000, Wapner served as the national spokesperson for Singer Asset Finance Company, LLC, a specialty finance company, appearing in national television commercials and print ads. Since around 2010, the soda company Rocket Fizz has marketed a beverage, Judge Wapner Root Beer, featuring the slogan, "I sentence you to drink my root beer." Wapner was active in Jewish causes, including sitting on the board of a Jewish school. He married Mildred "Mickey" Nebenzahl in 1946. Their daughter Sarah died from heart disease in May 2015 at age 56. They also had two sons who became attorneys: David Miron-Wapner and Fred Wapner, the latter of whom also became a judge (currently with the Los Angeles County Superior Court). Wapner also had four grandchildren and one great-grandchild. Wapner died from respiratory failure on February 26, 2017, at his home in Los Angeles. He was 97 years old. He is interred at Mount Sinai Memorial Park Cemetery in Los Angeles. ^ a b c d e f Troutman, Andrew (April 4, 1982). "Judge Joseph Wapner". Los Angeles Times. Retrieved November 26, 2013. ^ a b c d e f Bernstein, Adam (February 26, 2017). "Joseph Wapner, judge on 'The People's Court,' dies at 97". The Washington Post. Retrieved March 2, 2017. ^ "Hollywood High School Alumni Website". HollywoodHighAlumni.com. Archived from the original on December 17, 2007. Retrieved September 8, 2009. ^ a b Trott, Bill (February 26, 2017). "'People's Court' Judge Joseph Wapner Dies at 97: Reports". US News. Archived from the original on 2017-02-27. Retrieved February 26, 2017. ^ Grace, Roger M. (September 11, 2003). "Judge Wapner vs. Judge Judy: What A Match That Would Have Been". Metnews.com. Retrieved July 22, 2009. ^ "Judge Wapner is coming back to 'People's Court' this week". Fox News. November 11, 2009. Archived from the original on November 15, 2009. Retrieved February 26, 2017. ^ a b "Joseph Wapner – Biography". Jewage.com. Retrieved February 26, 2017. ^ "Judge Joseph Wapner, star of The People's Court, dies aged 97". BBC News. February 26, 2017. Retrieved February 26, 2017. ^ Williams, Rob (November 12, 1998). "Judge Wapner Shows DRTV Appeal; Singer Plans National Rollout". Direct Marketing News. Retrieved November 26, 2013. ^ "Judge Wapner Cream Soda". RocketFizz.com. Soda Pop Labels of Fame. Archived from the original on December 3, 2013. Retrieved November 26, 2013. ^ Hernandez, Marjorie (April 20, 2007). "Jewish University created: Brandeis–Bardin merges with Bel Air school". Ventura County Star. Archived from the original on August 7, 2011. ^ "Son says 'The People's Court' Judge Joseph Wapner has died". Chicago Tribune. Associated Press. February 26, 2017. Retrieved March 2, 2017. This page is based on the Wikipedia article Joseph Wapner; it is used under the Creative Commons Attribution-ShareAlike 3.0 Unported License (CC-BY-SA). You may redistribute it, verbatim or modified, providing that you comply with the terms of the CC-BY-SA.